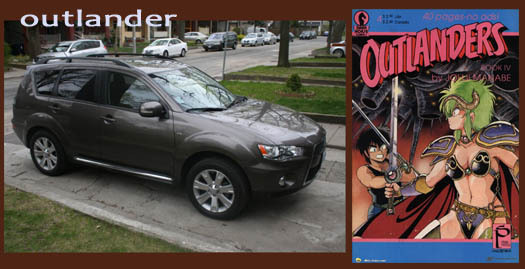 Did you know that many automobiles were named after classic Japanese animation characters? It’s a fact! No no, don’t check up on it, just trust us, automakers around the world chose to name their vehicles after cartoons. Happened all the time and nobody knows why. Were Detroit automakers secretly attending C/FO meetings? Were there legions of anime fans in the ranks of car companies around the world? Science will never learn the answer. In the meantime, we here at Let’s Anime put together the top eleven automobiles that were named after classic anime heroes and heroines. Can you guess which will be number one? #3- Windstar, the mid-sized Ford van, had a reputation for safety – meaning, while it was in the shop having the engine or transmission replaced, you aren’t out driving it, and you can’t get safer than that. On the other hand, Windstar from Jim Terry’s localization of Toei’s Planet Robo Danguard Ace was a hot-blooded, decidedly unsafe super robot pilot who had something to prove to his commander, the mysterious Captain Mask. #16- The curves and handling, the sleek lines, the spirited movement and the classy chassis all make Nova a delight to behold. And the car’s not bad either! Seriously though, this classic Chevy car was born in the ‘60s as a “compact” but with the addition of a V8 became a favorite on the dragstrip, and with the ’68 third generation, Nova became the muscle car we still see cruising the streets, until a mid 70s redesign left it boring and boxy. The Nova imprint was later used by Chevy to rebrand Toyota Corollas in the mid 1980s, producing a line of functional, seemingly unkillable compacts. Seriously; we set ours on FIRE and still got another 100,000 miles out of it. Similarly, the anime character Nova is both a fully trained medical professional AND a valuable member of the Argo’s bridge crew, handling the all-celestial radar, surviving Gamilons and Comet Imperials and Bolar Commonwealth attacks with ease. Unsure if she was ever set on fire. #37- The Astro was a rear-wheel drive mid-sized van produced from 1985 to 2005 by Chevrolet, noted for its trucklike hauling ability and its Spartan, boxlike interior that put efficiency ahead of comfort. The Astro Boy, on the other hand, is a robot boy with 100,000 horsepower created by Dr. Tenma, who once defeated Pluto to become the Greatest Robot In The World. #9- Not the album by prog-rockers Asia, nor Ultraman Leo’s twin brother, but the Opel Astra, a line of sporty compacts and mid-sized coupes marketed around the world under a variety of brands including Saturn, Chevrolet, and, in China, as Buick. A new, smaller Astra is set to debut at the Frankfurt auto show in September. Meanwhile in the world of imported Japanese cartoons, namely Star Blazers, Astra was the name given to Queen Starsha’s sister, who was sent to Earth with the plans for the Wave Motion Engine, but sadly who did not survive the journey. #62.5- Whether you want outer space ESP policemen or economical compact cars, Justy is the brand for you! Subaru’s endearing little three-banger charmed Americans looking for cheap, gas-friendly transportation in the late 80s and early 90s, while Tsuguo Okazaki’s Shonen Sunday manga, later localized in the US and animated as a 1985 OVA, is the melodramatic story of Justy, the space cop with the most powerful ESP powers in the universe, whose awe-inspiring abilities are moderated only by his warm-hearted humanity. #5- Several cars have been named Aurora – you may be familiar with the 90s Oldsmobile high-end sports sedan marketed with the name, or with the bizarre 1957 concept car produced by a vanity Connecticut auto manufacturer run by a priest and meant to be the safest car ever built, and probably was, as the single prototype kept breaking down on the way to the auto show. Anime fans, on the other hand, can watch the cartoon Princess Aurora go the distance all the way to the center of the galaxy as she led her team of SpaceKeteers on a mission to save the universe, in the series of the same name. #4- In the far reaches of outer space, the deadliest man alive is Cobra, the space bandit with the unstoppable Psycho-Gun. Meanwhile on the highways, the deadliest car alive is the Shelby Cobra, the unstoppable combination of big American engine and small European sportscar chassis – also the favorite auto of deadly bird-ninja Condor Joe. #4 (again)- Pronounce “Ghibli” however you like, the fact is that this Japanese animation studio has produced more Academy-award winning feature films than any other anime production outfit. Spearheaded by the one-two punch of Hayao Miyazaki and Isao Takahata, they’ve been a museum-building cultural powerhouse for decades. It’s not surprising that automaker Maserati would appropriate this name for that of their mid-sized luxury sedan. #88- Speaking of hot desert winds, the boys at Volkswagen will sell you a Scirocco, a six-speed sports coupe that’s sleek yet surprisingly practical. The Gundam villain Paptimus Scirocco, just to contrast, is an evil genius who arrives from distant Jupiter with a master plan to make himself master of the Earth Sphere, as seen in the 1985 animated series Mobile Suit Zeta Gundam. #13- The anime about the bikini-clad space princess and the hapless Earth boy – no, not THAT anime, but the OTHER anime about the space princess, you know, Outlanders, the Johji Manabe manga that got an early North American release courtesy Studio Proteus and a stunt-casted English dubbed anime? Yeah, that would make a great name for Mitsubishi to use for their smallish, underpowered line of SUVs, I guess. #7- Need a space navigator or a minivan? The Chevy Venture minivan was produced from 1997-2005. The 2000-2003 models could be "Warner Brothers" customized with WB branding, a DVD player (or VHS deck), classic WB cartoons, and built in child restraints. And just like Venture the anime character, which is the American name given to Daisuke Shima from Space Battleship Yamato, the ship's navigator and best friend of deputy captain Susumu Kodai, the Venture is a reliable companion for all of life’s journeys, whether to the Greater Magellanic Cloud or to the beach. And hey, as of this writing there are two days left in the Kickstarter campaign to publish Shaindle Minuk’s webcomic Element Of Surprise. Why not check it out? Sticker price does not include tax, tag, and title. Professional driver on closed course. Highway and city mileage may vary. Dealer may not have all makes in all colors. Some conditions may apply. Subject to local, state, and federal laws. Use only as directed.